The Divine Consciousness and Force are there and do at each moment the thing that is needed in the conditions of the labour, take always the step that is decreed and shape in the midst of imperfection the perfection that is to come. But only when the supermind has descended in you can she deal directly as the supramental Shakti with supramental natures. If you follow your mind, it will not recognize the Mother even when she is manifest before you. Follow your soul and not your mind, your soul that answers to the Truth, not your mind that leaps at appearances; trust the Divine Power and she will free the godlike elements in you and shape all into an expression of Divine Nature. The supramental change is a thing decreed and inevitable in the evolution of the earth-consciousness; for its upward ascent is not ended and mind is not its last summit. But that the change may arrive, take form and endure, there is needed the call from below with a will to recognize and not deny the Light when it comes, and there is needed the sanction of the Supreme from above. The power that mediates between the sanction and the call is the presence and power of the Divine Mother. The Mother’s power and not any human endeavor and tapasya can alone rend the lid and tear the covering and shape the vessel and bring down into this world of obscurity and falsehood and death and suffering Truth and Light and Life divine and the immortal’s Ananda. If you desire this transformation, put yourself in the hands of the Mother and her Powers without cavil or resistance and let her do unhindered her work within you. Three things you must have, consciousness, plasticity, unreserved surrender. For you must be conscious in your mind and soul and heart and life and the very cells of your body, aware of the Mother and her Powers and their working; for although she can and does work in you even in your obscurity and your unconscious parts and moments, it is not the same thing as when you are in an awakened and living communion with her. The unreserved surrender of your inner and outer being will bring this plasticity into all the parts of your nature; consciousness will awaken everywhere in you by constant openness to the Wisdom and Light, the Force, the Harmony and Beauty, the Perfection that come flowing down from above. Even the body will awake and unite at last its consciousness subliminal no longer to the supramental superconscious Force, feel all her powers permeating from above and below and around it and thrill to a supreme Love and Ananda. La conscience et la force divine sont là et font à chaque instant ce qui est nécessaire suivant les conditions du travail; elles prennent toujours la décision telle qu‘elle est décrétée et façonnent, au milieu de l‘imperfection, la perfection qui doit venir. Mais c‘est seulement quand le Supramental est descendu en vous que la Mère peut agir directement, en tant que Shakti supramentale sur des natures supramentales. N‘écoutez pas votre mental, il ne reconnaîtra pas la Mère même si elle est manifes- tée devant vous. Suivez votre âme et non pas votre mental, votre âme qui répond à la Vérité, non votre mental qui saute sur les apparences; confiez-vous à la Puis- sance divine et elle libérera en vous les éléments divins et façonnera tout en une expression de la Nature divine. Le changement supramental est décidé et inévitable dans l‘évolution de la con- science terrestre; car cette conscience n‘a pas terminé son ascension et le mental n‘est pas son sommet final. Mais pour que le changement arrive, prenne forme et dure, il faut qu‘il y ait l‘appel d‘en bas avec une volonté de reconnaître et non de repousser la Lumière quand elle vient, et d‘en haut la sanction du Suprême. La Puissance qui s‘entremet entre la sanction et l‘appel est la Présence et le Pouvoir de la Mère divine. Seule la Puissance de la Mère, et non aucun effort ou tapasyâ humain, peut briser le couvercle, déchirer le voile, façonner le vaisseau, et amener dans ce monde d‘obscurité, de mensonge, de mort et de souffrance, la Vérité, la Lumière, la Vie divine et l‘Ananda des immortels. Si vous désirez cette transformation, placez-vous sans hésitation ni résistance dans les mains de la Mère et de ses Pouvoirs et laissez-la travailler sans entraves en vous. Vous devez avoir trois choses: la conscience, la plasticité, la soumission sans ré- serve. Vous devez être conscient dans le mental, l‘âme, le cœur, la vie et même dans les cellules de votre corps, conscient de la Mère, de ses Pouvoirs et de leur action, car, bien qu‘elle puisse travailler et travaille en vous, même dans votre obscurité et dans vos éléments inconscients et vos moments d‘inconscience, ce n‘est pas la même chose que lorsque vous êtes dans une communion vivante et éveillée avec elle. La soumission sans réserve de votre être intérieur et extérieur produira cette plas- ticité dans tous les éléments de votre nature; la conscience s‘éveillera partout en vous par une ouverture constante à la Sagesse, la Lumière, la Force, à l‘Harmonie et la Beauté, à la Perfection qui se déversent d‘en haut. Le corps lui-même s‘éveil- lera, unira enfin sa conscience, qui aura cessé d‘être subliminale, à la Force supra- consciente supramentale, sentira toutes les Puissances de la Mère l‘imprégner d‘en haut, d‘en bas et d‘alentour et tressaillira à l‘Amour et à l‘Ananda suprême. Das Göttliche Bewusstsein und dessen Kraft sind da und vollbringen in jedem Augenblick, was entsprechend der Bedingungen des Werkes nötig ist, unternehmen stets den vorgesehenen Schritt und gestalten inmitten des Unvollkommenen die Vollkommenheit, die sein soll. Aber erst wenn das Supramentale in dich herabgekommen ist, kann sie (Die Mutter) direkt als die supramentale Shakti (Bewusstseinskraft) mit supramentalen Naturen umgehen. Wenn du deinem Denkwesen folgst, wird es Die Mutter nicht erkennen, selbst wenn sie verkörpert vor dir steht. Folge deiner Seele und nicht deinem Denken, deiner Seele, die der Wahrheit antwortet, nicht deinem Denken, das auf Äußerlichkeiten anspricht; vertraue der Göttlichen Kraft und sie wird die gottgleichen Wesensteile in dir befreien und alles zu einem Ausdruck göttlicher Natur machen. Der supramentale Wandel ist eine vorherbestimmte Sache und unumgänglich in der Evolution des Erd-Bewusstseins; denn seine Aufwärtsbewegung ist nicht beendet und das Denkwesen ist nicht sein letzter Gipfel. Aber dass der Wandel geschehe, Form annehme und beständig sein möge, ist der Ruf aus der Tiefe nötig, verbunden mit einem Willen das Licht zu erkennen und nicht abzulehnen, wenn es kommt, und gegeben muss die Zustimmung Des Göttlichen aus der Höhe sein. Die Kraft, die zwischen der Zustimmung und dem Ruf vermittelt, ist die Gegenwart und Kraft der Göttlichen Mutter. Die Kraft Der Mutter und keine der menschlichen Bemühungen und Anstrengungen kann allein die Verhüllung beseitigen und wegreißen die Verdeckung und formen das Gefäß und herabbringen in diese Welt von Dunkelheit und Falschheit und Tod und Leid Wahrheit und Licht und göttliches Leben und des Unsterblichen Glückseligkeit. Wenn du dich nach dieser Transformation sehnst, vertraue dich den Händen Der Mutter (dem Wirken des göttlichen Bewusstseins) und ihren Kräften ohne Zweifel oder Zurückweisung an und lasse sie ungehindert ihr Werk in dir tun. Drei Dinge musst du haben, Bewusstsein, Geschmeidigkeit, uneingeschränkte Überantwortung. Denn du musst in deinem Denken und deiner Seele und deinem Herz und Leben und in den Zellen deines Körpers bewusst sein, gewahr Der Mutter und ihrer Kräfte und deren Wirkensweise; denn obgleich sie selbst in deiner Dunkelheit und deinen unbewussten Wesensbereichen und Augenblicken wirken kann und tut, ist es nicht das Gleiche, wie wenn du dich in einer wachen und lebendigen Verbindung mit ihr befindest. Die uneingeschränkte Überantwortung deines inneren und äußeren Wesens wird diese Formbarkeit in alle einzelnen Teile deiner Natur hinein bringen; Bewusstsein wird überall in dir erwachen durch ständiges Offensein zu der Weisheit und dem Licht, der Macht, der Harmonie und Schönheit, der Vollkommenheit, die beginnen aus der Höhe herabzuströmen. Selbst der Körper wird erwachen und schließlich sein Bewusstsein, das nicht länger unterschwellig ist, mit der supramentalen überbewussten Macht vereinen, fühlen, dass all ihre Kräfte von oben und unten und allen Seiten eindringen und wird sich auf eine höchste Liebe und Glückseligkeit mit Entzücken einstimmen. ‘About the 1st Line of Savitri’ by Michel Montecrossa is a bonus bonus movie from the ‘Meditations On Savitri’ movie series – the epic poem ‘Savitri’ written by the poet and mystic Sri Aurobindo is his major work and most important introduction to his integral yoga and realization. The ‘Meditations on Savitri’ series visualizes Savitri in 12 parts through images, painted by Huta Hindocha, on the basis of original drawings and detailed instructions by Mira Alfassa – The Mother. The ‘Meditations on Savitri’ movies present all images together with recitations from Savitri spoken by Mira Alfassa – The Mother and accompanied by her own organ music. The ‘Meditations on Savitri’ series was produced and directed by Michel Montecrossa on commission and with the special blessings of Mira Alfassa – The Mother. Übersetzung des kompletten Vortrags von Michel Montecrossa anlässlich des International Free Cinema Film Festivals in Mirapuri über seine Art der Filmkunst – die englische Original-Version des Vortrags mit dem Titel ‘MY MOVIES’ kann man in diesem Blogartikel nachlesen. Der zu dem Vortrag entstandene Film (‘My Movies’) enthält Ausschnitte aus Michel Montecrossa’s Filmen ‘The House Of Time‘ sowie dem New-Topical-Song-Movie ‘Talkin‘ Future World‘. Today starts the Mirapuri World Literature Fest 2018 that takes place from 26th till 28th October 2018 at the Omnidiet Resort and Business Hotel in Mirapuri (Italy). 18:00 Opening of the Mirapuri World Literature Fest 2018, by Michel Montecrossa and Mirakali. The Mirapuri World Literature Fest 2018 presents books and multimedia by Sri Aurobindo, Mira Alfassa – The Mother, Michel Montecrossa and Mirakali in English, French and German language, published by Mirapuri Verlag with a special presentation of the bilingual Deutsch/English study edition of MEDITATIONS ON SAVITRI. 12:00 Meditation at the Miravinci, the Meditation Center of Mirapuri, with the New Age Seminar lecture by Michel Montecrossa ‘Mirapuri – a revolutionary creation for the birth into a new humanity’ and the recorded lecture by Mira Alfassa – The Mother ’It would be better to have wisdom than an opinion’. The Mirapuri World Literature Fest 2018 takes place from 26th till 28th October 2018 at the Omnidiet Resort and Business Hotel in Mirapuri (Italy). ‘Shakti Songs meet Orgastica-DJ & Cyberpoetry’ is the title of the grand Acoustic & Electronica Concert by Michel Montecrossa and Mirakali in the Omnidiet Music-Hall in Mirapuri on 14th October 2018 starting 21:00 till 23:00 featuring Michel Montecrossa’s new intensity of acoustic Stream-of-Consciousness Songs and Mirakali’s exciting Orgastica-DJ Instrumentals that go along with the recitations of her expressive Zen-Style Cyberpoems. 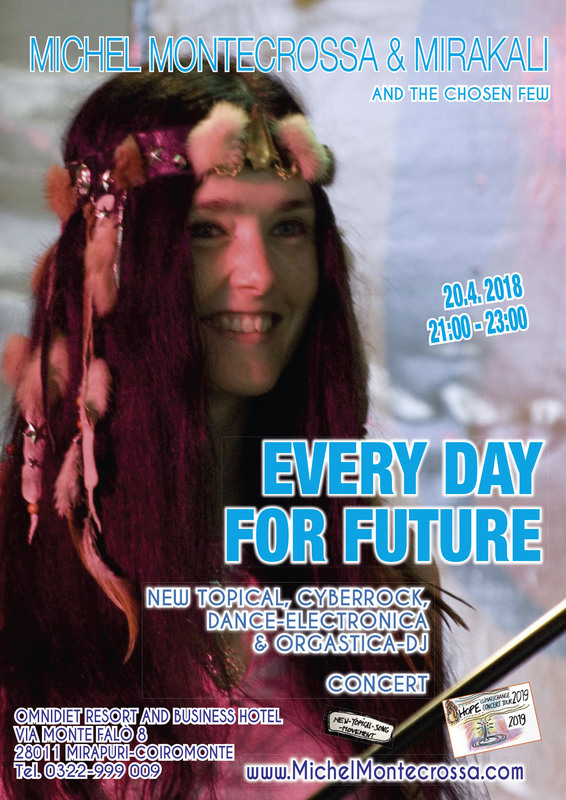 The setlist includes great songs like the title song ‘Shakti Ballad’ by Michel Montecrossa as well as Mirakali’s avant-garde Orgastica-DJ instrumentals like ‘Sunworld Dream’ together with her soulful Zen-Style Cyberpoetry like ‘Sensual Light’ and many more.